Enemy Territory Quake Wars - OMG! There are many Quake-based games, so it can be a little confusing trying to keep a tab. Which Quake are we talking about now? 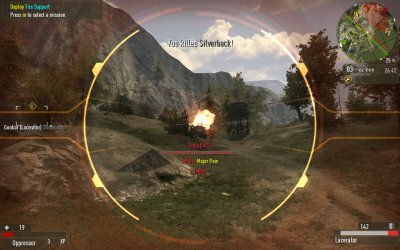 Then, the first half of the game title brings up the memories of the goodie but oldie Wolfenstein, another long series of great First Person Shooters. Throw in Unreal Tournament and the confusion only gets bigger. But it's really simple, actually. Forget all the other games. There's Enemy Territory Quake Wars. Enemy Territory Quake Wars (ETQW) is not a new release. Yet, like a child discovering a new toy, I spend half a day salivating over the Linux demo version, which I downloaded and installed on my LG RD510 laptop, powered by a decent 512MB Nvidia 9600GS card. 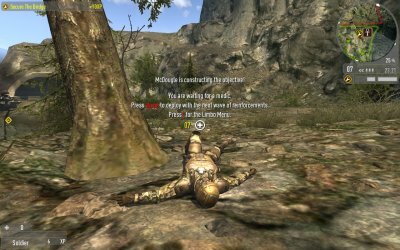 With merely two and a half years delay, I bring you a review of this superb game. Well, I did review UFO: Enemy Unknown some 15 years after its release, so I guess it's ok.
ETQW is a class-based team-oriented First Person Shooter. 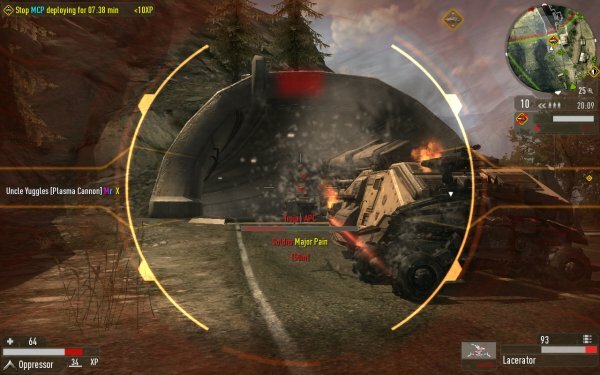 However, unlike most titles where you merely blast your opponents to smithereens, ETQW places emphasis on mission objectives and close cooperation with your buddies. The first half of the game name is more than just a flake of nostalgia; it's a hint. 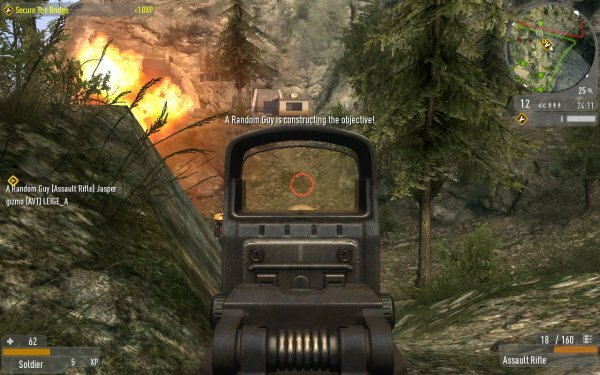 ETQW incorporates Real Time Strategy elements in the gameplay, very similar to that seen in Wolfenstein Enemy Territory and recently Savage. There are five different units available, each with its unique abilities. You can fight either as a human (GDF) or an alien (Strogg). 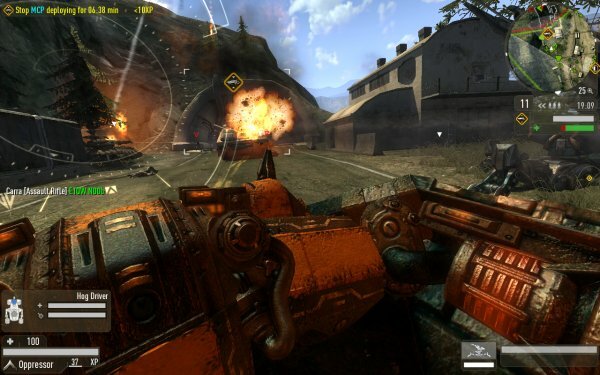 Humans have the common trooper, who fights with a handful of rifles and grenades. Then, there's the engineer, who can do all kinds of engineering tricks, build defenses, place mines, and sabotage enemy vehicles. The Field Ops is very similar to Engineer, except that he touts heavy artillery. Medic has the role of helping and reviving stricken comrades. 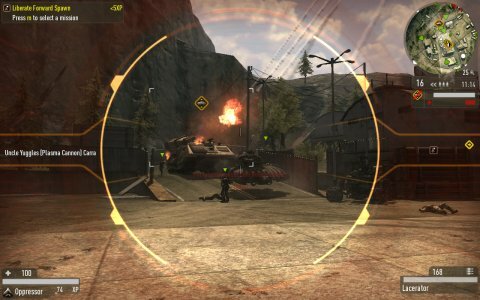 Covert Ops can snipe from afar, place surveillance cameras or disguise themselves as enemy units, infiltrating behind the enemy lines. Strogg units include: The Aggressor, the equivalent to human soldier; The Technician, who can deploy temporary energy shield shelters and some heavy guns and call in air strikes. The Constructor is similar to GDF Engineer; one of the novel technologies he can use are gravity mines, species-oriented so that only humans can trigger them. 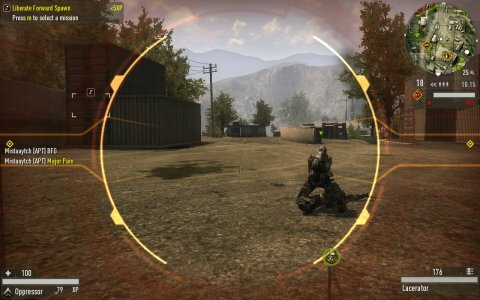 Oppressor is the Field Ops counterpart, carrying lots of heavy weaponry. Lastly, there's the Infiltrator, with a rather self-explanatory job description. Infiltrator can take the shape of enemy troops and teleport himself away from danger, but has less firepower and sabotage abilities than the human unit. As you can see, the Strogg favor offensive and force, hence no medic. The game has a price tag, but a demo is available, a hefty 700MB download worth every bit of your bandwidth. The first time you hit the server list, the game will recommend you try a tutorial play with AI bots. This is most recommended, since ETQW is a hectic, complex game. Like Wolfenstein, it takes time getting used to. You need a moment or two to appreciate the fact brute force does not necessarily work. You have to put the special characteristics of your class to good use, otherwise you're a waste of resources and a liability to your team. You also need to learn using the array of weapons in your arsenal. The basic instinct is just to shoot the main rifle. However, it's only good against enemy infantry at short to medium range. 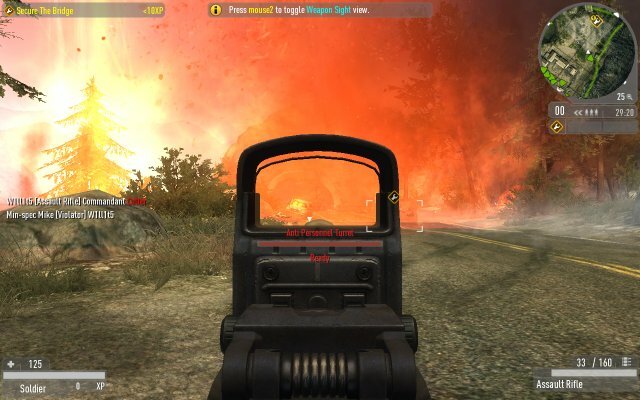 Other weapons offer you the ability to engage enemy vehicles and call in fire support. 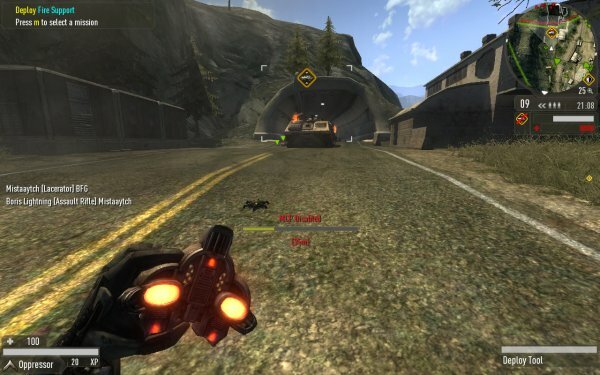 Then, you can also commandeer vehicles in the game, including quads, tanks, heavy engineering vehicles, and even jetpacks, which allow you to fly above the combat zone and spew death from above. Mastering all of these is crucial to becoming proficient in the game. In plain terms, this means staying alive and helping your team gain the objectives. Completing in-game missions is critical to success. You will be rewarded with experience points, which in turn will make you faster, smarter and less prone to die from massive enemy fire. This is an important incentive in putting down the Rambo tactics and working hard and closely with your team. Another very important aspect is learning to digest the game pace and the torrent of information blasted at you. ETQW dictates a very fast, brutal pace. 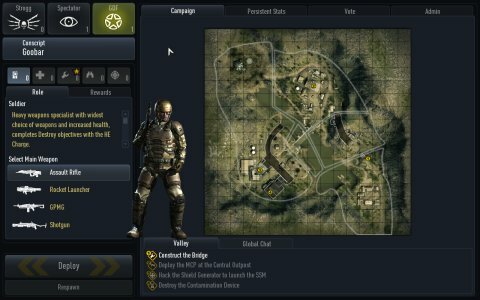 Furthermore, the combat zone is saturated with air and land units, both friends and foe. You will need some time distinguishing between them, as well as filtering out the less important details. At any given moment, there will be tens of troops on the field, plus a handful of tanks and some air units, buzzing, shooting, exploding, making your head spin. All combined, you're in for a treat. Even the hour-long demo tutorial mission is more than enough to grab you and hook you in. You'll find yourself wearing down your keyboard as you rush into the action. The deep noise of futuristic machinery, the din of fright and panic and the colorful explosions all around will drop you right into the heart of action. You will only stop playing when your wife reminds you, in politest yells possible, to come to eat your dinner. 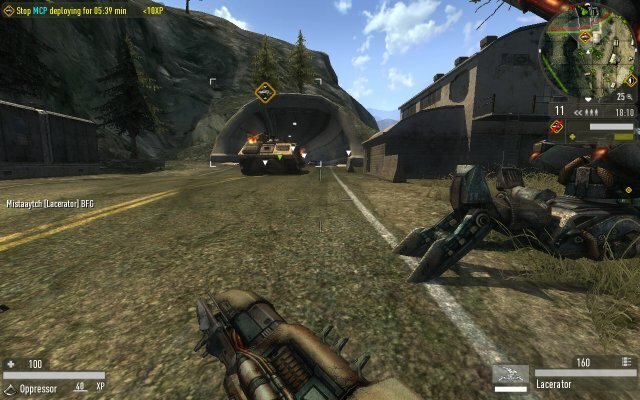 With the demo, you can also play online, but only on servers that do not require PunkBuster anti-cheat protection. 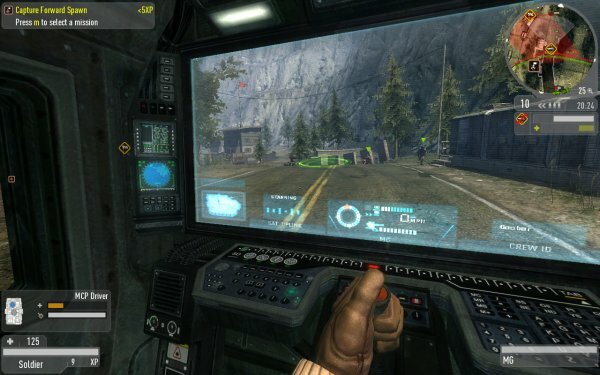 The demo tutorial campaign and single mission against the computer are essentially identical. Still, like I said, the demo is more than enough to get you convinced to buy the game. What more, you will be replaying the Valley map quite a few times, until you get it right. ETQW has beautiful graphics. The game has an open, airy feeling with lovely vistas and careful attention to detail, like the trees, rock and grass. Throw in a handful of Year 2100 technology stuff and you might be thinking you're an extra in a Terminator movie. With the detail level set to maximum, the game ran smoothly, without any lag. It was a splendid visual experience overall. Maybe it's a little corny mentioning the fact this was achieved on Linux, but like many other excellent games, Enemy Territory Quake Wars proves the Linux gaming, shall we call it, problem, is not one of technology. I have missed my train with ETQW, but it's never too late to start. This is a fabulous game with extremely pleasing graphics, a rich and detailed gameplay, and the fun bits that made Wolfenstein so popular. At just seven dollars on Amazon, it's a mistake not to buy it. Enemy Territory Quake Wars seems like a very smart investment. And if you have decent hardware with a Linux distribution on top of it, then here's a good chance to put it to some good use. If you have skeptic friends who may point out that Mahjongg is the only game running on Linux, again, you have a gloating platform and some lovely screenshots to show. Linux gaming wars and bickering aside, for First Person Shooter fans, ETQW is what they want. Personally, I think it's more oriented toward younger crowds, with a heavier emphasis on pace and lots of pretty detail, but older gamers can also enjoy it, since the game incorporates classic elements of careful, dedicated teamwork and asymmetric warfare. Either way, consider buying yourself an early New Year present. One of them, that is.